The Adams Rite 8611 and 8622 narrow stile concealed vertical rod exit devices are for aluminum stile glass doors with 2" minimum stile. This device does not come with the vertical rods. This Adams Rite 8600 series is a concealed vertical rod exit device for aluminum stile glass doors with a stile width minimum of two inches. This device operates as exit only. It does not allow entry from the outside. It is supplied standard with hex-key dogging. The Adams Rite 8611 and 8622 narrow stile concealed vertical rod exit devices are for aluminum stile glass doors with 2" minimum stile. The Adams Rite 8801EL with electric latch retraction is a narrow stile rim exit devices are for aluminum stile glass doors with 2" minimum stile. This Adams Rite 8801SE-36 is a 8800 series rim exit device with Silent Electrification Motorized Latch Retraction.This feature allows for the unlatching of the exit devices from a remote location or an access control device. It is a fail secure operating device .Silent Electrification Motorized Latch Retraction option provides near silent operation for quiet environments such as hospitals, offices, hotels, and libraries where solenoid-driven devices would be disruptive. This Adams Rite 4580-602 is a replacement cam disk for levers and paddles and it is for right handed doors 2-1/4" thick. This Adams Rite 8400 is an excellent mortise exit device that will fit narrow, medium and wide aluminum stile glass doors. It is available with various push-bar lengths, in a variety of backsets and with handing options, to make for a device that will perfectly suit the needs of your application. 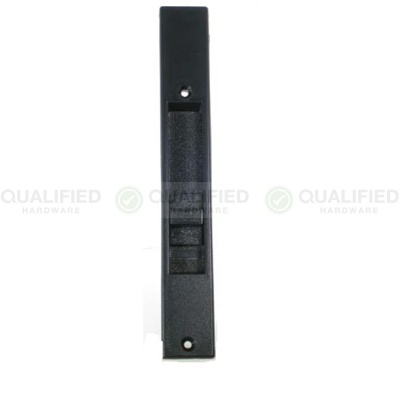 This Adams Rite 7240-340-630 electric strike is fire rated for up to 3 hour rated door assemblies. It is designed for hollow metal jambs with a cylindrical lock that has a maximum 5/8" projection latch. Designed for greater key control, the 1877 Cylinder-Operated Flushbolt prevents accidental locking of the inactive leaf of paired wood doors. May be installed to lock at threshold or at header. the Adams Rite MS1880 Two-Point Flushbolts offer greater convenience than flip-lever flushbolts. With one operation, they provide security. Adams Rite 7400-M electric strike with faceplate for use with any door equipped with an Adams Rite series 4500/4700/4900 (or similar) deadlatch or "key-in-lever cylindrical locks with 1/2" or 5/8" deadlatch. The Adams Rite stainless steel MS1950-050 Deadlock utilizes a laminated stainless steel bolt, activated by a pivot mechanism to provide maximum security for a single leaf narrow stile door. The Adams Rite eForce-150 (3090-01) is a battery operated keyless entry control for Adams Rite dead latches and exit devices that are compatible with aluminum stile, steel and wood door applications. The Adams Rite Dual Force 2290 Interconnected Deadbolt/Deadlatch provides access control and security for wood or hollow metal doors. Latch and deadbolt capabilities are combined for fast, easy, and panic-proof exiting. For 2-1/4" thick door. The Adams Rite 7100 electric strike with monitoring switch is specifically made for aluminum narrow stile door openings and jambs where remote electrical control of Adams Rite 4500/4700/4900 deadlatch set is needed. This Adams Rite 8200 surface vertical rod exit device fully meets building codes and ADA guidelines for accessibility. It is designed to fit narrow, medium and wide aluminum stile glass doors with minimum stile width of 2 inches. Includes cylinder dogging. This Adams Rite 8611LR-36 with Electric Latch Retraction is a concealed vertical rod exit device for aluminum stile glass doors with a stile width minimum of two inches. This device operates as exit only. It does not allow entry from the outside. The Adams Rite 8802EL with electric latch retraction is a narrow stile rim exit devices are for aluminum stile glass doors with 2" minimum stile. This Adams Rite 4900 is a narrow stile deadlatch for aluminum doors. This deadlatch offers flexibility of traffic control and installation. It is great for applications that require occasional free entrance since a reverse turn of the key while the bolt is held retracted retains the bolt to allow for two-way traffic . The Adams Rite 8801-M with monitor switch narrow stile rim exit devices are for aluminum stile glass doors with 2" minimum stile. Adams Rite - 7170-319-628 Special Order Electric Strike Monitoring for Wood or Hollow Steel Jambs. The Adams Rite 7170 electric strike with monitor switch for Wood or Hollow Steel Jambs and mortise or cylindrical 3/4" latches without deadbolt. The adams Rite BBK-SE is a add on board required for battery backup with the PS-SE power supply. The Adams Rite 8600-SE narrow stile concealed vertical rod exit devices are for aluminum stile glass doors with 2" minimum stile. The Adams Rite 4060-05-130 is the turn for the 1875 2 point deadlock. The Adams Rite 91-0904 is a switch kit (RX) for the 4591 paddle. Inside pull for use with 4430 or 4431 flush lock. 7440 Electric Strikes with 4-7/8" faceplate are designed for Adams Rite deadlatches or cylindrical locksets with 1/2" to 5/8" latchbolt projection. For use in hollow metal or wood doors and jambs. Opens electrically under 35lbs. of preload. Direct upgrade for Adams Rite 7140 Electric Strikes. 7440M Electric Strikes with 4-7/8" faceplate are designed for Adams Rite deadlatches or cylindrical locksets with 1/2" to 5/8" latchbolt projection. For use in hollow metal or wood doors and jambs. Opens electrically under 35lbs. of preload. Direct upgrade for Adams Rite 7140 Electric Strikes. The Adams Rite 8801 and 8802 narrow stile rim exit devices with battery powerd alarm are for aluminum stile glass doors with 2" minimum stile. The Adams Right 4568-02 is a Eurostyle Lever designed to operate 4500,4700 and 4900 series latches by a natural downward hand movement. Modern European styling offers a generous hand grip with shank offset away from the narrow stile jamb for hand safety. For doors 2-1/4 to 2-1/2 thick. Adams Rite 7400 electric strike with faceplate use with any door equipped with an Adams Rite series 4500/4700/4900 (or similar) deadlatch or "key-in-lever/cylindrical locks with 1/2" or 5/8" deadlatch. The Adams Rite 8222 narrow stile surface vertical rod exit devices are for aluminum stile glass doors with 2" minimum stile. The Adams Rite 8622 narrow stile concealed vertical rod exit devices are for aluminum stile glass doors with 2" minimum stile. Adams Rite - 4600-03-12-32D Special Order Heavy Duty Lever for 4500/4700/4900 Series Latches. The Adams Rite 4600 heavey duty lever is designed to operate 4300/4500/4900 series latches with either an upward or downward motion. Shipped handed, but easily field reversable. The Adams Rite 8211SE-36 has the Motorized Latch Retraction Option for Adams Rite exit devices and is one of the most secure, quiet and convenient ways to electrify a door opening for optimum security and performance. The MS 1837 provides maximum security for wood door pairs by a single turn of a key. By dropping a stainless steel hexbolt into the threshold and pivoting the massive MS bolt into the opposite leaf, the MS1837 eliminates inconvenient and sometimes forgotten flushbolts in the inactive leaf. Adams Rite(R) earned its reputation as a leader in architectural hardware by continually offering innovative lines of electric strikes, exit devices, swinging door, sliding door and store front aluminum door hardware. QualifiedHardware.com is a stocking distributor of Adams Rite(R) door hardware. The origins of Adams Rite(R) date back over 100 years. Founded as Pacific Brass Mfg. Co., in 1896, the company originally produced ornate hardware for some of the old European style mansions then being built in Southern California. In 1927, the firm was purchased by a small group of stockholders and operated under the name Rite Hardware Company. One of the stockholders, Mr. George R. Adams, purchased the company, and in 1931, his son, Arthur R. Adams, joined him in operating the business as Rite Hardware Manufacturing Company. The company foresaw the growth of the aircraft industry and began diversifying to produce locks, latches and handles for aircraft. In 1936, the company turned out the first locks ever developed for this specific purpose, installed on the Douglas DC-3. Recognizing the growing need for aerospace hardware, the aircraft product line was expanded. In 1945, Adams Rite Manufacturing Company was incorporated and began developing along two distinct lines - architectural hardware and aircraft hardware. The two divisions were separated into distinct companies. The Architectural Hardware Division moved to Los Angeles, and the Aircraft Division remained at the Glendale location. In 1981, the company was sold again, and the two divisions were eventually consolidated in a single plant in Fullerton, California. In 1999, the aviation division was sold, and in 2006, Adams Rite(R) Manufacturing was aquired by the ASSA ABLOY Group, the global leader in door opening solutions, dedicated to satisfying end-user needs for security, safety and convenience. Adams Rite(R) designs, manufactures and markets door and door hardware products to the commercial, industrial and institutional construction industry both here in the US and abroad. QualifiedHardware.com is proud to carry a broad selection of Adams Rite(R) products. With an extensive inventory of exit devices, electric strikes and aluminum door hardware, QualifiedHardware.com offers competitive prices and free shipping within the Continental US for all Adams Rite(R) locks, hardware and accessories.